Alternative is defined as a genre of music that embraces attributes of progression and innovation in both the music and attitudes associated with it. It is often a less intense version of rock or a more intense version of pop and is typically regarded as more original, eclectic, or musically challenging. It may embrace a variety of subgenres or any hybrids thereof and may include recordings that don't fit into other genre categories. In 1991, and from 1994 to 1999, the award was known as Best Alternative Music Performance. Beginning in 2001, award recipients included the producers, engineers, and/or mixers associated with the nominated work in addition to the recording artists. As of 2018, Radiohead, The White Stripes and Beck share the record for the most wins in this category, having won three times each. 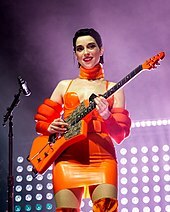 Two female solo artists have won the award, Sinéad O'Connor and St. Vincent, and one time has been won by a band with a lead female vocalist by Alabama Shakes with Brittany Howard as their lead singer. 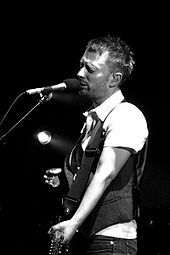 With eight nominations to date, Radiohead and Björk hold the record for the most nominations in this category; Radiohead singer Thom Yorke was also nominated for the 2007 award for his solo album, while Björk also holds the record for the most nominations for a solo artist, as well as the record for the most nominations without a win. Coldplay has each received the award twice, and are the only group to win two years consecutively. American artists have been presented with the award more than any other nationality, though it has been presented to musicians or groups from the United Kingdom five times, from Ireland twice, and from France once. "Past Winners Search: Alternative". National Academy of Recording Arts and Sciences. Retrieved June 16, 2011. "Grammy Awards: Best Alternative Music Performance". Rock on the Net. Retrieved April 27, 2010. ^ "Grammy Awards at a Glance". Los Angeles Times. Tribune Company. Archived from the original on June 29, 2012. Retrieved April 29, 2010. ^ "Overview". National Academy of Recording Arts and Sciences. Retrieved April 29, 2010. ^ a b Popkin, Helen A.S. (January 23, 2006). "Alternative to what?". msnbc.com. Retrieved April 29, 2010. ^ "Grammys return to New York". TimesDaily. Tennessee Valley Printing. May 25, 1990. Retrieved April 29, 2010. ^ a b Pareles, Jon (January 11, 1991). "Grammy Nominees Announced". The New York Times. The New York Times Company. Retrieved April 29, 2010. ^ "Grammy Award Winners". National Academy of Recording Arts and Sciences. Archived from the original on January 18, 2010. Retrieved April 29, 2010. Note: User must select the "Alternative" category as the genre under the search feature. ^ Pareles, Jon (January 9, 1992). "Grammy Short List: Many For a Few". The New York Times. The New York Times Company. Retrieved April 30, 2010. ^ DeYoung, Bill (February 23, 1993). "One critic handicaps tonight's Grammys". The Gainesville Sun. The New York Times Company. Retrieved April 29, 2010. ^ Campbell, Mary (January 7, 1994). "Sting, Joel top Grammy nominations". Star-News. The New York Times Company. Retrieved April 29, 2010. Browne, David (February 24, 1995). "1995 Grammy Award nominees". Entertainment Weekly. Retrieved February 14, 2017. Wilker, Deborah (March 2, 1995). "Grammys Finally Know Who's The Boss". Sun-Sentinel. Retrieved February 14, 2017. ^ "List of Grammy nominees". CNN. January 4, 1996. Retrieved April 29, 2010. "The Complete List of Nominees". Los Angeles Times. January 8, 1997. p. 2. Retrieved February 14, 2017. "Winners of the 1997 Grammy Awards". The New York Times. February 28, 1997. Retrieved February 14, 2017. ^ "No Spice, Plenty Of Age In Grammy Announcement". MTV. January 6, 1998. Retrieved April 29, 2010. ^ "41st annual Grammy nominees". CNN. January 5, 1999. Retrieved February 14, 2017. "42nd Annual Grammy Awards nominations". CNN. January 4, 2000. Archived from the original on July 22, 2012. Retrieved April 29, 2010. Strauss, Neil (February 24, 2000). "Santana Dominates Grammy Awards". The New York Times. Retrieved February 14, 2017. ^ Hiatt, Brian; vanHorn, Teri (January 3, 2001). "Dr. Dre, Beyoncé Lead Grammy Nominees". MTV. Retrieved April 29, 2010. 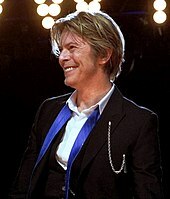 ^ Basham, David (January 24, 2002). "Got Charts? Creed, Eminem, No Doubt, 'NSYNC Have Something In Common". MTV. Retrieved April 29, 2010. ^ "Grammy nominees and winners". CNN. February 24, 2003. Retrieved February 14, 2017. ^ D'Angelo, Joe (January 12, 2004). "White Stripes To Perform At Grammy Awards". MTV. Retrieved April 29, 2010. ^ "Grammys 2007: A list of the nominees". Entertainment Weekly. December 7, 2006. Retrieved February 14, 2017. ^ Gundersen, Edna (December 7, 2007). "Kanye West and Amy Winehouse lead Grammy nominees". USA Today. Retrieved April 29, 2010. ^ Stout, Gene (February 6, 2009). "Grammys Awards: Who will perform, who will win, who should win". Seattle Post-Intelligencer. Hearst Corporation. Retrieved April 29, 2010. ^ "Grammy nominations 2010 announced – Beyonce, Lady Gaga, MGMT shortlisted". NME. IPC Media. December 3, 2009. Retrieved April 29, 2010. ^ "Grammys 2011 Winners List". Billboard. February 13, 2011. Retrieved February 14, 2017. ^ "Grammy Awards 2012: Complete Winners And Nominees List". The Hollywood Reporter. February 12, 2012. Retrieved February 14, 2017. ^ Eggertsen, Chris; Ellwood, Gregory; Hasty, Katie (February 10, 2013). "55th Grammy Awards – winners and nominees". HitFix. Retrieved February 14, 2017. ^ "The Recording Academy" (PDF). National Academy of Recording Arts and Sciences. p. 3. Retrieved February 14, 2017. ^ "Grammys 2015: Complete list of winners and nominees". Los Angeles Times. February 8, 2015. Retrieved February 14, 2017. ^ "2016 Grammy Awards: Complete list of winners and nominees". Los Angeles Times. February 15, 2016. Retrieved February 15, 2016. ^ "Beyoncé Leads 59th Grammy Nominations". Grammy Awards. December 6, 2016. Retrieved December 6, 2016.